This concert marked the accession of Sweden to the EU Presidency, with a programme of mainly northern music. Lindberg (who changed his costume three times !) was a persuasive conductor, maintaining pulse with knees bend and movements of his whoe body, whilst directing detail with the baton as a left-handed conductor. The first half was a little disappointing, with yet another version of Pärt's ubiquitous Fratres less than convincing, although Christian Lindberg has had great success with it. 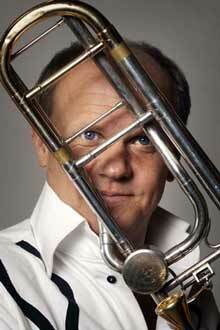 In his own Kundraan he went through his trombone tricks familiar from the Motorbike Concerto, but one was left wondering if Berio hadn't had the last word in his trombone Sequenza? 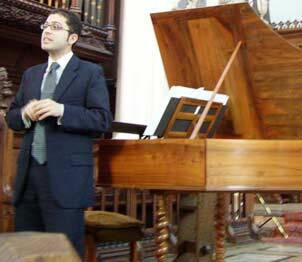 The young Iranian-born harpsichordist Mahan Esfahani's recital of solo works with northern musical connections was a significant success; he gave a fine demonstration of the scope of a fine Bruce Kennedy instrument of 1992. John Jakob Bach's departure to join the Swedish army was happily commemorated by his brother Johann Sebastian in his vividly pictorial Capriccio, one of J S Bach's earliest compostitions extant, which Esfahani introduced. Royer's virtuoso Marche was a memorable tour de force. Catch its on R3 broadcast at lunchtime, 17 July. A marvellous evening at the Lord Mayor's home, one of London's most gorgeous occasional venues for music; the acoustics at Mansion House are as fine as the surroundings, and it was a privilege to be there. On one of the hottest days of our heat-wave, it was comfortably air-conditioned. 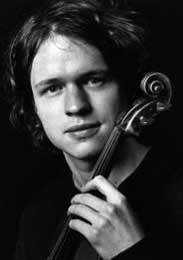 Reluctant beforehand at the thought of having to listen yet again to the Seasons, it was spell binding under Henning Kraggerud, a versatile international violinist *. Well regarded ofr normal violin repertoire, he proved to be a quite exceptional baroque stylist and an inspiring director; the Britten Sinfonia clearly loved him. Henning Kraggerud concentrated our attention by introducing the details of the programme notes, in the form of sonnets which were included in the first printed edition and thought to be by Vivaldi himself. Jacqueline Shave was in charge of the interesting selection of Nordic music, and the (mainly) string orchestra provided thrilling sonorities. Rautavaara's Fiddlers (1952) with its evocations of Villagers in fine fettle etc came up fresh, and Tüür's proved to be an absorbing tri-partite work, a veritable symphony for strings. Salonen's Diary was less interesting; I've not found his compositions to have realised the promise of the early showpiece Floof for soprano and small ensemble. * See my long-ago review of Kraggerud's Naxos CD of the Grieg Sonatas. 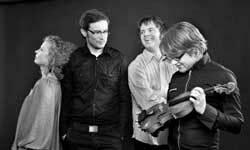 And see also Ben Hogwood's much fuller review of this special concert in Classical Source. The Schubert displayed their special qualities, which to some extent seem to be Meta4's trademark bid for recognition, rather more than to serve the composers. Dynamics were exaggerated, from ppp to fff even within a single chord. A consideable pleasure was in their treatment of the pervasive tremolo ("riddled with tremolandi") which is a unique feature of this work, encouraging a quasi-orchestral treatment. Especially notable was the first violinist's frequent retreat into playing these quietly, as a feeling rather than a rapid battery. There were some beautiful solo passages from the cellist to savour. Given with all repeats, the performance held attention right to the end. There was no encore. This was one of COLF 2009's finest hours, actually nearer an hour and a quarter. 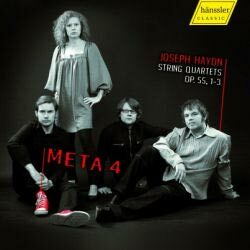 One of the best string quartets before the public, Meta4 (BBC New Generation Artists) have received accolades in London, but we had not previously encountered them. The choice of works to represent their native Finland was ideal. Kuusisto's Play III begins and ends with carefully composed "noise" and has virtuoso passages for each of the instruments; a piece to make you look out for others by this composer. Saariaho's Terra Memoria (timely, with her opera at The Coliseum this week !) is searchingly meditative, exploring changing feelings about those who have departed... Very beautiful, and a work which requires repeated hearings. The Sibelius quartet came across as powerfully as any of his symphonies. I have loved it for some sixty years, but only latterly does it seem to be coming into its own in concert programmes. A special feature this time was the bright acoustic of St Vedast, wood panelled, ideal for chamber music. Sight lines looked to be impaired, but all was well with the quartet playing standing up. They are suspersensitive, with impeccable intonation, achieved by careful, unusually prolonged tuning. Their energy is quite uncommon, and this was a perfectly planned programme. Meta4's debut recording has been received and enjoyed. They were required to choose a"single composer" programme and opted for this because they were engaged to play these in a Haydn series in Madrid.Their Basel mentor Hatto Beyerle had said "if you can play Haydn, you can play anything...".